Strength-training activities increase the strength and endurance of your muscles. Examples of strength-training activities include working out with weight machines and free weights. You do not need to invest in a gym membership or buy expensive home gym equipment to do strength-training activities. Hand, wrist, and ankle weights are less costly options. Also, homemade weights, such as plastic soft drink bottles filled with sand or water, may work just as well. You can also use your own body weight, doing activities such as push-ups, pull-ups, and sit-ups. You could also buy a resistance band at a sporting-goods store. It looks like a giant rubber band, and stretching it helps build muscle. In each strength-training session, you should do 8 to 10 different activities using the different muscle groups throughout your body, such as the muscles in your abdomen, chest, arms, and legs. Repeat each activity 8 to 12 times, using a weight or resistance that will make you feel tired. When you do strength-training activities, slowly increase the amount of weight or resistance that you use. Also, allow 1 day in between sessions to avoid excess strain on your muscles and joints. Don’t hold your breath during strength training activities. That could cause changes in your blood pressure. It may seem strange at first, but you should breathe out as you lift something, and breathe in as you relax. 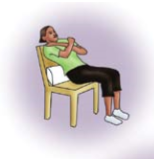 Below is a strength-training activity that you can do at home, and all that you need is a chair and some pillows. It’s called the “Chair Stand,” and it strengthens muscles in your abdomen and thighs. It also helps improve your balance. 1. Place pillows on the back of a chair. 2. 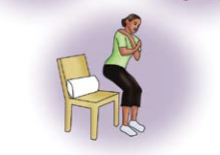 Sit toward the front of the chair, knees bent, feet flat on the floor. 3. Lean back on the pillows in a half- reclining position. Keep your back and shoulders straight throughout the activity. 4. Raise your upper body forward until sitting upright, using your hands as little as possible (or not at all, if you can). Your back should no longer lean against the pillows. 5. Slowly stand up, using your hands as little as possible.